Support How to change first day of week on month calendar week? Discussion in 'Android Devices' started by Fred G. Vader, Apr 26, 2012. 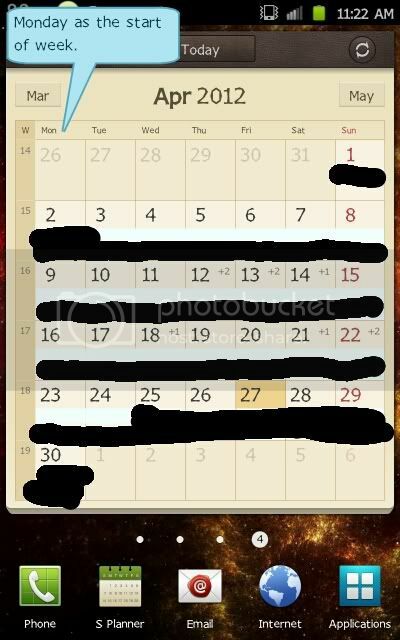 Monday is the default first day of the week on the month calendar widget. Anyone know how I can i change it to be Sunday? Just kidding. Can you just go to a month that happens to start on the day you want it to and use that one? I would think the system calendar would automatically start on the right day of the month. Are you using the default Calendar app (S-Planner)? If so, just hit the menu button, select 'Settings' > 'First day of the week' > set it to 'Sunday'. That's the very first thing I check and change in all my calendar apps. I don't know why some default to Monday being the first day. I think that works only for the "app", not the "widget". The settings work for the widget as well (I just played with it). But I think only for default. I don't know if Fred is using the default or 3rd party one? Edit: This is with 'Monday' set as start week in S-Planner. HTH. Ah...must have been stuck. Just got my At&t Note this week...Calendar set to "Sun", but widget started with "Mon". I switched setting to Mon, then removed/re-added to desktop, then set back to "Sun". Widget now starts w/Sun. Fred G. Vader likes this. Thanks Colnago, this worked for me. Weird though, cause my calendar settings already had Sunday as the first day of the week. I changed it to monday, removed the widget, went back into the calendar settings and changed it back to sunday (where it was originally-came that way I might add), re-added the widget and now the first day of the week is sunday. Thanks for the tips! Out of curiosity, why is your calendar icon labeled S-Planner but mine is labeled Calendar? International version vs. at&t version. at&t left out/"took lesser versions of" different software. I don't have the international version. Apparently the Canadian version left the stock ROM intact. Mine is from Rogers, but I use it with another carrier. It has Rogers bloatware added on top of the stock which I can't uninstall. The Canadian GNote doesn't have any branding logo on it either (Rogers, Telus, Bell, etc). It carries the Samsung logo on the phone. I always wondered why Sunday is even considered as the first day of the week in north American calendars, especially since it coined the word 'week-end'. To me as in most places in the world, the 1st day of the week is the 1st day of work and the week-end falls on Saturday and Sunday, therefore, Sunday can never be the 1st day. OK so biblically "God rested on the sabbath" which to some is technically Saturday but since this is a biblical thing, don't most people go to church on Sunday? So, to each their own this I know, but for my own education, if you don't mind the trouble of me asking you, why would you want Sunday to be the 1st day?